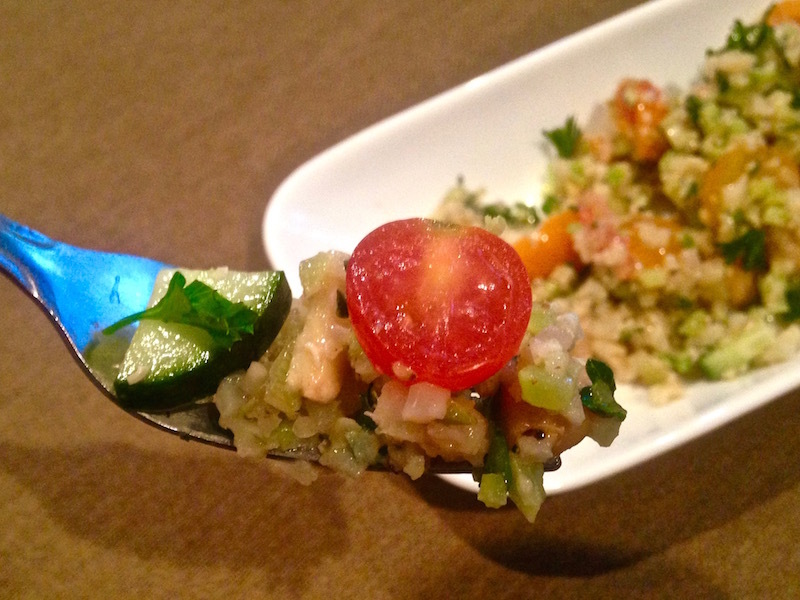 It Looks Like a Quinoa Salad… But It’s NOT! | Keep It Up, David! 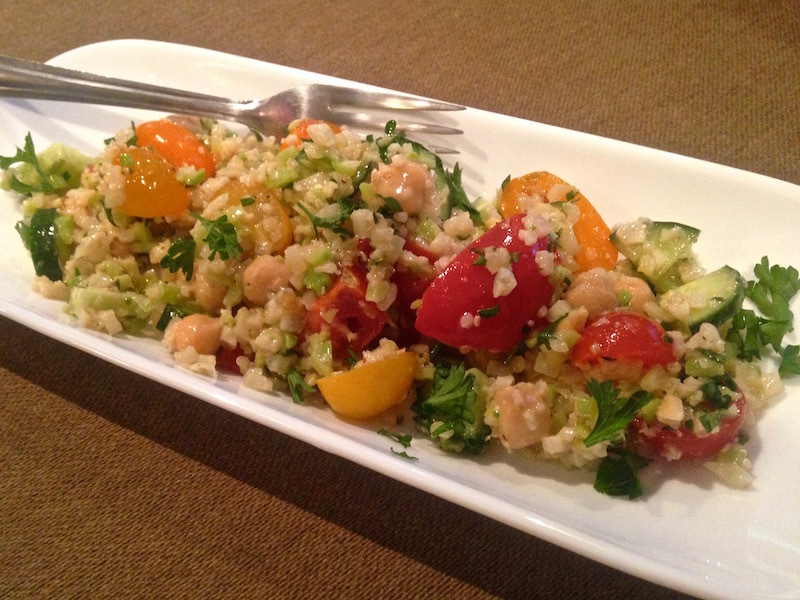 It Looks Like a Quinoa Salad… But It’s NOT! If it looks like a grain-based salad, and it tastes like a grain-based salad, it’s gotta be a grain-based salad, right? WRONG! There’s not a single grain on that plate. 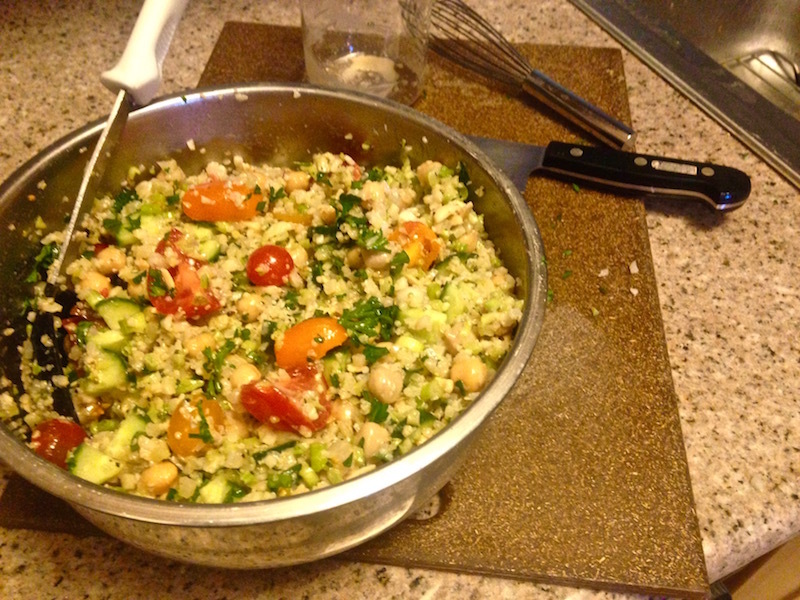 I made this salad with… riced cauliflower! Riced cauliflower is raw cauliflower that’s been chopped into rice-sized pieces. You can make it yourself with a box grater or food processor, or you can buy it pre-riced at Trader Joe’s, and, soon, a bunch of other places. I’ve used it in the past to make pizza crust (Yes! Try it! 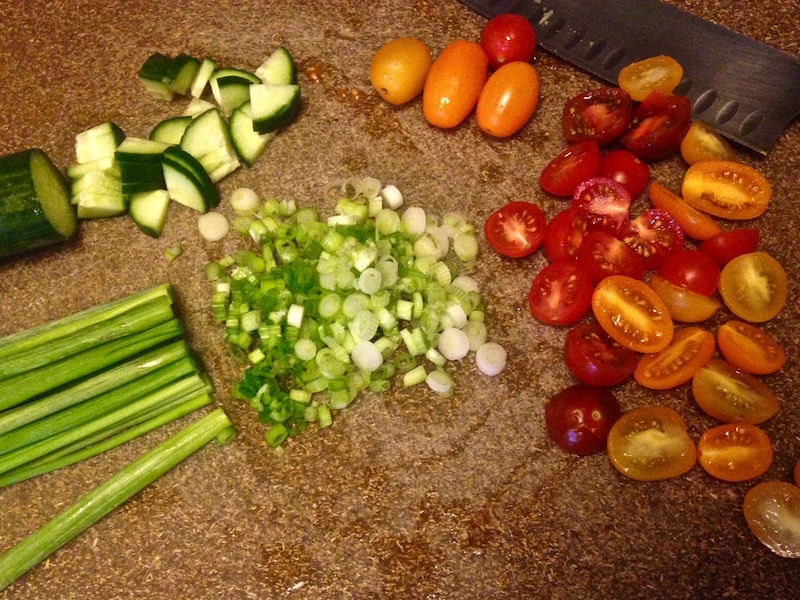 Here’s the recipe), but I wanted to try something new, so I built a salad around it. When I picked up a bag at Trader Joe’s, I noticed they now sell riced broccoli, too! So I purchased a bag. But enough about my shopping, let’s get on to the recipe! 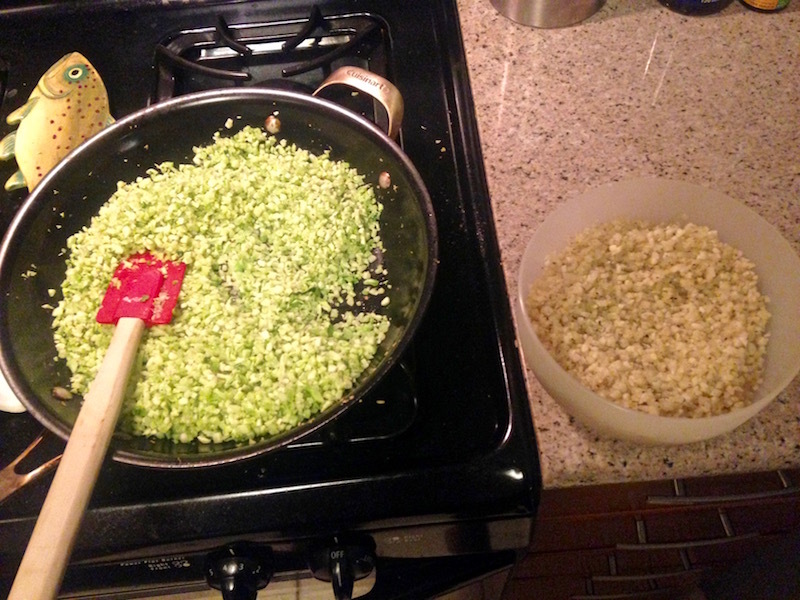 Start by sauteing 3 cups of riced cauliflower (that’s an entire bag from Trader Joe’s) and 1 cup of riced broccoli in 1 tablespoon olive oil. Season it with a little salt and pepper. It doesn’t need to cook long, just 3 or 4 minutes – enough to soften a little bit. I actually cooked them separately, but that’s because I cooked the whole bag of riced broccoli, and set aside the rest for another meal. I also added 1 ounce raw hemp hearts. 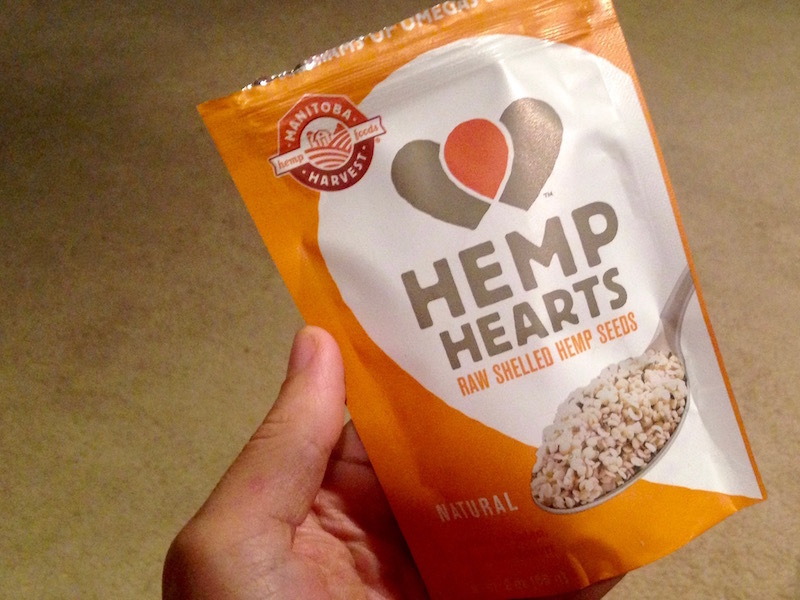 Like chia or flax, hemp hearts are high in healthy fats and protein. Manitoba Harvest was a sponsor at the Fitbloggin’ conference I spoke at in July, so I came home with a couple free pouches of hemp hearts. Score! I like them in yogurt and sprinkle them as a garnish on soup, but they’re a little too coarse for smoothies. And if you can’t find hemp hearts, no big deal. I didn’t add enough to really taste them in the dish, it was just a way to make the salad a more well-rounded affair, nutritionally. Then I tossed everything together! Done. I took this to a barbecue, where a couple people said, “Hey, the quinoa salad was great. Did you make it?” Everyone was surprised it was cauliflower. And it’s delicious. Lots of fresh, bright flavors. 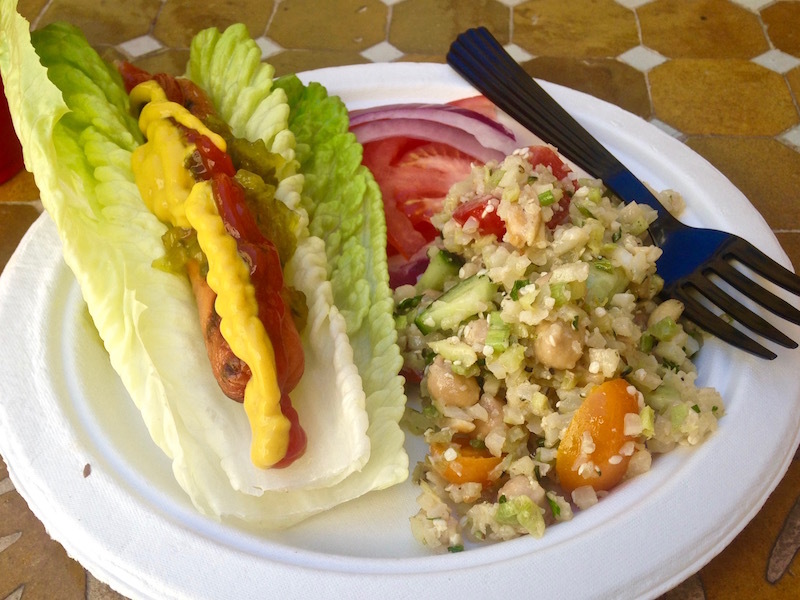 At the barbecue, I ate it alongside a carb-free hot dog – I replaced the bun with a romaine lettuce leaf. A 1-cup serving of the salad has 185 calories, 12.2 grams of fat, and only 13.5 grams of carbs. If you wanted to lower the calorie count more, leave out the almonds (and subtract 36 calories per serving), the garbanzo beans (subtract 42 calories per serving), or replace this dressing (60 calories per serving) with a lower-calorie bottled one. The best thing about this salad is that you can use the riced cauliflower as a base, and add in whatever you have lying around. Bell peppers would be great, as would thin strips of red onion, zucchini, walnuts, olives, corn, raisins or dried apricots (although maybe not all together). I look forward to playing around with this idea! For more healthy and delicious recipes, check out my RECIPES page. This entry was posted on Tuesday, September 20th, 2016 at 1:11 am and is filed under Uncategorized. You can follow any responses to this entry through the RSS 2.0 feed. You can leave a response, or trackback from your own site. 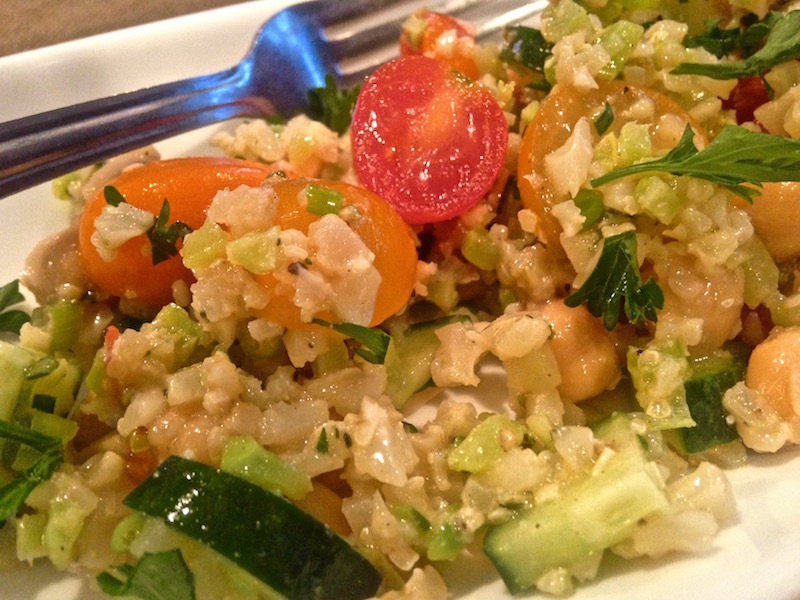 3 Responses to It Looks Like a Quinoa Salad… But It’s NOT! I tried cauliflower rice. It will take some adjustment. I felt like a dog where I needed to mix it into some regular rice to begin the adjustment process. I’m glad you tried it and hope you continue with your adjustment process! It’s not a bad idea.